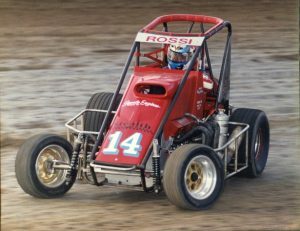 Tony Rossi’s introduction to auto racing, as was the case with many north Denver kids, involved going to Lakeside Speedway with his dad, who also took him races at Century 21 Speedway and USAC national shows in Colorado Springs. From the start, the midgets were Tony’s favorite form of racing. Young Tony was inspired by early racing heros such as Grier Manning and Eddie Jackson, and he knew from the start that there was no help for being hooked on racing. As soon as he could, he began his racing career by competing in the Minisprint division at Second Creek Raceway, eventually driving to a Colorado Mini Sprint Association championship. While the Minisprints were an affordable racing class, Tony had his heart set on racing midgets as soon as he could. Once he had worked his way up to the midget division, Tony raced his way to an accomplished career. He competed at events in nine states, including National events such as the prestigious Belleville Midget Nationals and the Chili Bowl classic in Tulsa, Oklahoma. In Rocky Mountain Midget Racing Association competition, he was the 1999 Rookie of the Year, and went on to four season championships and numerous main event, heat, and quick time wins in more than two decades of competition. He also won two Curt Stockwell Sportsmanship Awards and seven perfect attendance awards with the club, and served as its president and board of director member for many years. Tony has said that every time he’s gone to the race track is a dream come true, that racing is an honor, and every time tightening the belts is a blessing. For his racing accomplishments, as well as his dedication and contributions to Colorado Motorsports, Tony Rossi was inducted into the Colorado Motorsports Hall of Fame in 2018.